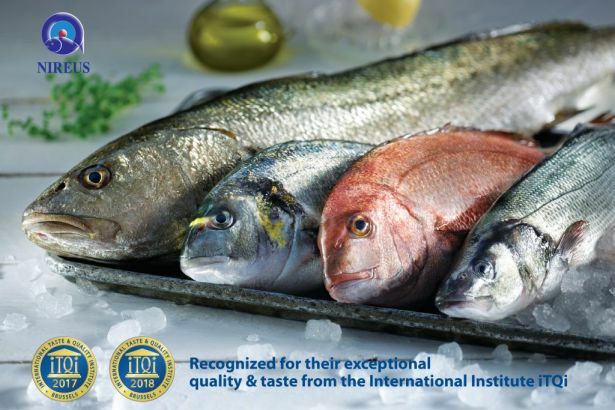 NIREUS has been granted a prestigious distinction for its sea bream and sea bass with the Superior Taste Award 2018, granted by the International Taste & Quality Institute (iTQi), based in Brussels. This distinction complements the range of NIREUS products that are awarded for their superior taste. The iTQi Superior Taste Award is the only quality seal in taste given by opinion leaders, who include Michelin-recognised chefs and sommeliers. The judges of the iTQi Commission come from 17 different countries. During the sessions, each product is subject to a blind taste test, according to strict sensory-analysis rules. The International Taste & Quality Institute honoured Greece in the presence of the Belgian ambassador in Athens and the members of the iTQi jury. The award ceremony for Greek producers took place on Tuesday 26 June at the Divani Palace Acropolis.